I love picture books. I don't read enough of them, as I always seem to be reading aloud from books for my high school and jr. high students instead. So the chance to review a picture book was quite appealing to me. It makes me sit down and read to the littlest of my kids. And in this case, a tale I already know -- and one I know I've read to the older guys once upon a time. 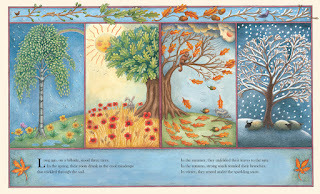 The Three Trees: A Traditional Folktale is written by Elena Pasquali and most beautifully illustrated by Sophie Windham. I sat all my kids down (ages 5, 7, nearly 11, nearly 13 and 14) to read this. The teen and near-teen rolled their eyes a bit, but they complied. 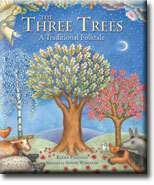 Three forest trees dream of what they will one day become. One dreams of becoming a royal throne; one of being a ship that can withstand any storm; and one longs to stay in the forest and grow as tall as tall can be. When they are felled, it seems their dreams are over. But as each tree is crafted into a new item--a manger, a fishing boat, and a rugged cross—it becomes clear that through the role they play in one important life their hopes are more than fulfilled. This traditional folktale is accompanied by stylish artwork from a highly sought-after children's book illustrator, and will help set the Christmas and Easter stories into the overall context of the Christian faith. My kids all enjoyed it. Even the eye-rollers. Connor, 14: "It was a good re-telling of this tale. The illustrations are nice, and I think they would really make little kids want to really look at them and thus have the book read to them again." William, 12.9: "I liked how they (the trees) came in at the beginning (manger), middle (fishing boat) and end (cross) of Jesus' life. 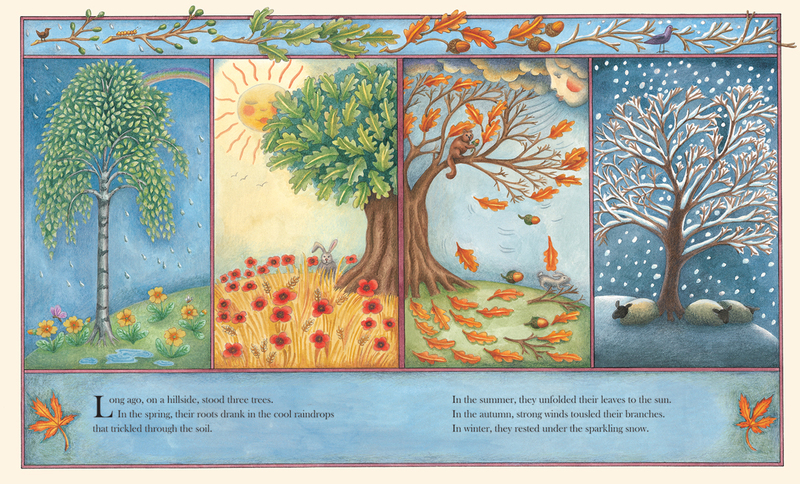 The illustrations are very good and they help tell the story quite nicely." Thomas, 10.9999: "I liked it. I liked how originally all the three trees hopes were shattered, and then they all got what they wished for by encountering Jesus." Trina, 5: "It was fun. The thing I liked best was how all of the trees finally got to do what they wanted to. And the pictures were good too." As you can see from the above two-page spread, the illustrations are a lot of fun. And like some of my kids mentioned, the best part was how all three trees failed on their own, but all their hopes and dreams were fulfilled when they encountered Jesus.